Hardware enthusiasts are probably already aware of Futuremark and its PCMark software, a standard for testing and comparing computer hardware for years. PCMark is popular among reviewers and users for its comparison of hardware on standards that are more likely to reflect real-world, typical usage. Today Futuremark announced that it's bringing the software to the "Big three" mobile operating systems, Android, iOS, and Windows Phone. Futuremark's press release did not include a date. PCMark is designed for typical usage scenarios, unlike the more gaming and performance-focused PowerMark and 3DMark (which already has an Android version). It follows that the mobile versions will, according to the press release, "focus on the activities and tasks that smartphone and tablet owners perform every day." Since battery life is such a crucial feature for mobile hardware, there will also be a big efficiency component. 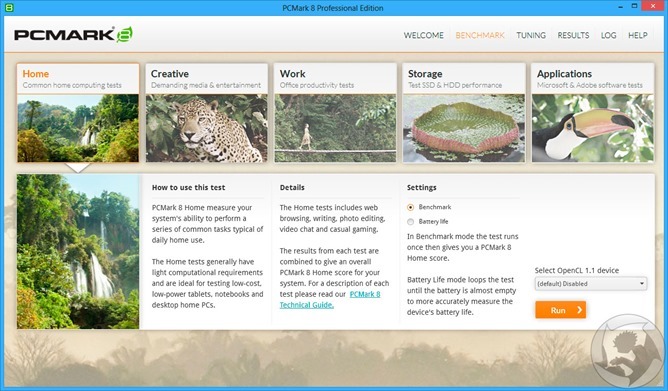 PCMark 8 for Windows tests storage, application performance, battery life, and common work and creative scenarios. The basic edition is free, while the advanced edition designed to test Microsoft Office and Adobe Creative Suite performance, among others, is just shy of $50. Futuremark will be creating a Mobile Benchmark Development program, based on a similar system for their full-sized software. Relevant mobile companies are invited to join to get access to advanced builds and provide development input. We'll be on the lookout for the Android version of PCMark, though the product may get a bit of rebranding before its release. It should be interesting to see the cross-platform numbers. HELSINKI--(BUSINESS WIRE)--Futuremark® is creating a new PCMark® benchmark for Android, iOS and Windows RT devices and is calling on mobile manufacturers to join the development. Companies in the PCMark Mobile Benchmark Development Program (BDP) will have the opportunity to provide input at all stages of development in addition to receiving regular development builds and complimentary site licenses for the new benchmark. Technology companies operating in the mobile industry such as carriers, OEMs, ODMs, component manufacturers and their suppliers are invited to apply for BDP membership now. For details please visit http://www.futuremark.com/bdp. Like its Windows counterpart, PCMark for mobile platforms will feature benchmark tests based on common use scenarios, focusing on the activities and tasks that smartphone and tablet owners perform every day. Designed for modern mobile devices, PCMark will provide a view of real-world system performance and power efficiency. Futuremark's Benchmark Development Program is an initiative for building partnerships with leading hardware and technology manufacturers. The new PCMark Mobile Benchmark Development Program will complement Futuremark's existing PCMark Windows BDP which counts Acer, AMD, Compal, Condusiv Technologies, Dell, HGST, HP, Intel, Lenovo, Microsoft, NVIDIA, Samsung, SanDisk, Seagate and Western Digital as members. PCMark for mobile platforms is in development now. Companies interested in joining Futuremark's Benchmark Development Program should call Oliver Baltuch on +1-408-614-2025 (PST) or email [email protected]. Further information about the Program can be found on Futuremark's website: http://www.futuremark.com/bdp/.